At the 2009 World Championships the men's figure skating title seemed destined for Frenchman Brian Joubert thanks to the absence of Russian great Evgueni Plushenko, Swiss big shot Stephane Lambiel and the title holder Canada's Jeffrey Buttle. 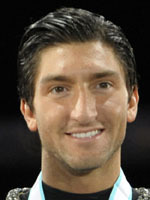 But slender American Evan Lysacek, then 23, finished streets ahead after Jaubert both stumbled and failed to complete a quad. Having taken bronze in 2005 and 2006, the signs had been there but the top two steps are the hardest and few get to climb them. Skating brilliantly to the music "Rhapsody in Blue", Lysacek, who trains in Los Angeles, received a rousing ovation from the crowd of about 6,000 at the Staples Center arena. He had come second in the short programme but surged past 2007 World Champion Joubert to clinch the gold. Lysacek's routine included nine triple jumps, a double Axel and a flying sit spin and he started celebrating early pumping his fists in the middle of his closing change foot combination spin. If there was any thoughts this was a fluke Lysacek then produced the best skating of his career at the Tokyo ISU Grand Prix finals, making him a real contender for the Vancouver gold despite the stiff competition. He was originally attracted to ice hockey, but was better at figure skating as three junior world titles in 2001, 2003 and 2004 soon outlined. When quitting school in Chicago in 2003 he put his foot down on the gas with a wise career move to Los Angeles to take up with reputed coach Frank Carroll, who had previously guided the quadruple world champion Michelle Kwan. Under Carroll's guidance Lysacek was soon in the medals taking a first senior bronze at the 2004 Four Continents and the following season at Moscow he again struck bronze at the World Championships placing third behind Lambiel and Buttle. For his first Olympics he missed out on the medals in Turin as Plushenko walked it ahead of Lambiel and Buttle. But at the worlds a month later with Plushenko absent he took another bronze at Calgary behind Lambiel and Joubert. After the Games Lysacek and Carroll worked hard on ironing out the blips caused by the skater's height,whilst reserving his elegant style. He began to wear Dior outfits and drafted in choreographers Lori Nichol, Kurt Browming and Tatiana Tarasova, all masters in the art. So when he was crowned world champion in front of wild Los Angeles fans it was thanks to a long hard haul, culminating ion two faultless programs. Vancouver is then, within the bounds of possibility for Lysacek, who would be the first American to claim this particular Olympic title since Brian Boitano at Calgary in 1988.